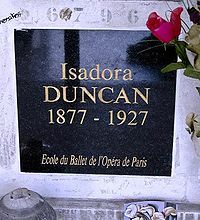 English: Isadora Duncan born Angela Isadora Duncan (May 27, 1878 - September 14, 1927) was an American dancer. She is considered the Mother of Modern Dance. Isadora Duncan. Picture by Arnold Genthe (1869-1942). Sergei Yesenin and Isadora Duncan, 1923. This page was last edited on 3 September 2018, at 19:48.